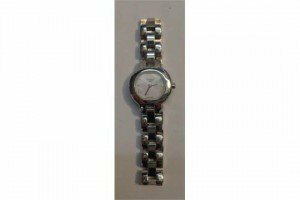 A ladies Tissot Wristwatch with crystal lens, mother of pearl dial with white stone markers, stainless steel case & strap. 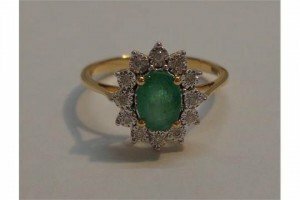 An 18ct Gold Diamond & Emerald Ring, central oval emerald surrounded by 12 diamonds in basket setting. 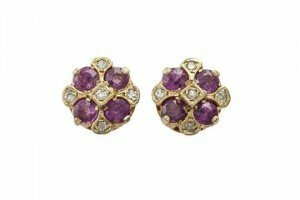 A pair of diamond and pink tourmaline ear studs, each composed of circular pink tourmalines between single-cut diamonds, mounted in 9 carat gold. 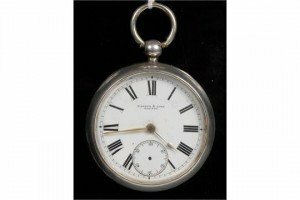 An American Watch Co silver open face pocket watch, bold Roman numerals, minute track, subsidiary seconds, key wind movement. 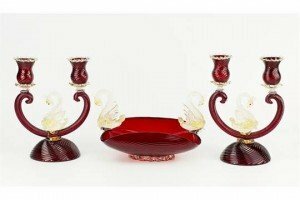 A three piece Murano ruby glass table garniture, comprising fruit bowl of rectangular form with fold-in edges, ornamented with a clear glass and gilt swan to each side. 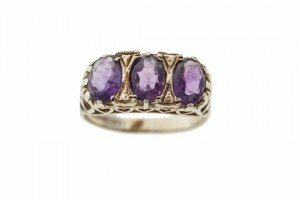 An amethyst three-stone 9 carat gold ring, set to front with a trio of oval mixed-cut amethysts. 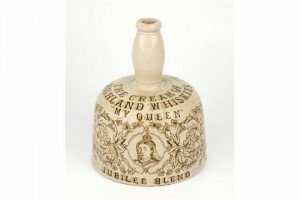 A Queen Victoria Jubilee mallet shaped whisky jug, Sepia print with central portrait of Queen Victoria encircled with leaf decoration. 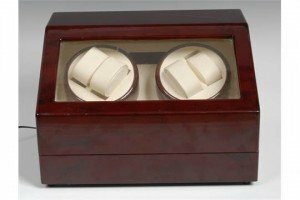 A contemporary mahogany effect table top automatic watch winding display case, sloped hinged front, twin rotating double watch winding wheels, above six watch cushions. 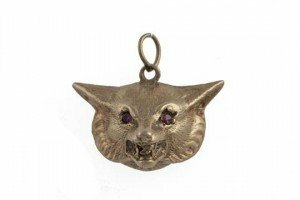 A Victorian 9 carat gold pendant of a fox head, the overall textured pendant set with red paste eyes. 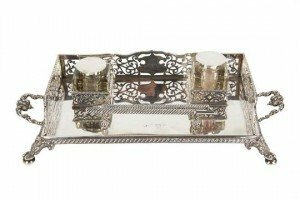 An impressive silver inkstand, the rectangular tray with three quarter pierced scrolling gallery, two square deposits of conforming design holding faceted glass wells with hinged circular lids. 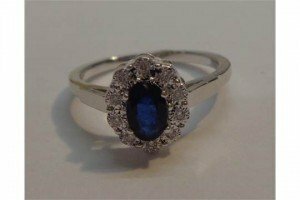 An 18ct White Gold Sapphire & Diamond Ring, central oval facet cut sapphire surrounded by 10 illusion set diamonds. 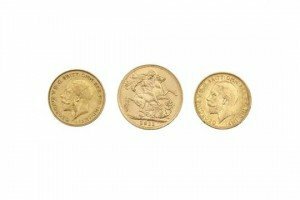 Three gold sovereigns, comprising a George V, 1911, full sovereign together with two half sovereigns, both George V 1918 and 1912. 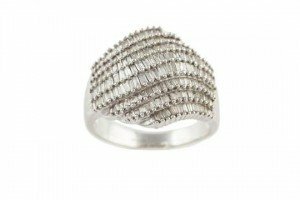 A diamond ring, set to front with graduated scrolled rows set with baguette-cut diamonds, mounted in 9 carat gold, diamonds approx 0.52 carat total. 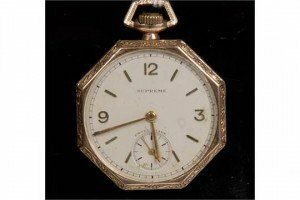 A hexagonal Art Deco Supreme gold plated dress pocket watch, silvered dial, Arabic numerals, subsidiary seconds, engine turned exterior. 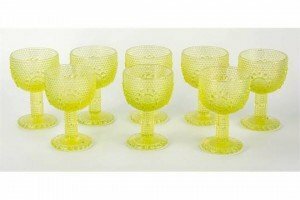 A set of eight pale green uranium pressed glass goblets, the cup bowls with raised dot work design bearing four roundel motifs, cylindrical stem with central band made from larger domed dots, on flat circular foot, the underside with conforming decoration. 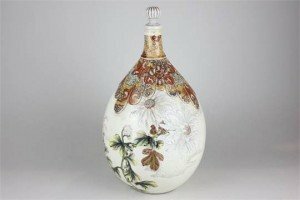 A Japanese Satsuma pottery bottle with stopper, ovoid shape, decorated with chrysanthemums, with overlaid decoration to the top of the bottle in irregular brightly coloured strips. 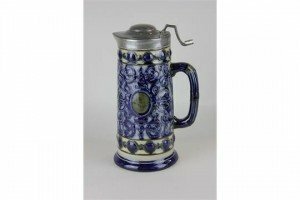 A Victorian stoneware pewter lidded jug with overlaid floral scroll decoration around central cartouches. 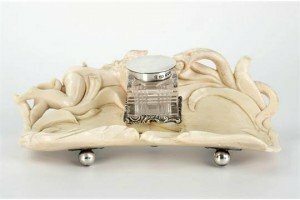 A carved ivory and silver ink stand, early 20th century, the rear bearing a carved depiction of Eve retrieving the apple of knowledge from the serpents mouth, concave base section with silver deposit containing a cut glass well with circular hinged lid. 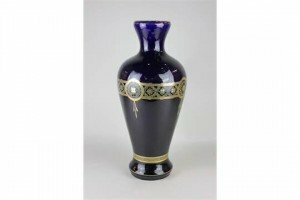 A cobalt blue glazed porcelain vase with gilt decoration of a stylised rose inside a laurel wreath, with banded border. 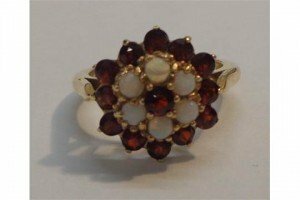 A 9ct Yellow Gold Garnet & Opal Cluster Ring, centre garnet surrounded by 6 opals & garnets.